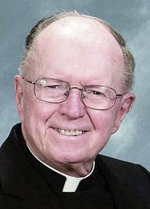 Father Charles E. Gormley, 93, pastor emeritus of Mother of Divine Providence Parish in King of Prussia, died Jan. 28. Father Gormley was born in Philadelphia, the son of the late Charles E. and the late Hannah (McNamee) Gormley. He attended St. Gregory School, Philadelphia; St. Rose of Lima School, North Wales and St. Thomas More High School before entering St. Charles Borromeo Seminary. He was ordained May 19, 1951 at the Cathedral of SS. Peter and Paul by Bishop Hugh L. Lamb and his first assignment was as parochial vicar at St. Patrick Parish, Pottsville. He also served at St. Patrick, Norristown; St. Veronica, Philadelphia; St. William, Philadelphia; St. Michael the Archangel, Levittown and St. Helena, Philadelphia. He also served as parochial administrator at Mother of Divine Providence before being appointed pastor in 1982. While Father Gormley enjoyed life, Houston recalls, he was a very holy man which showed in the way he celebrated Mass and in the confessional. Father Gormley was named pastor emeritus of Mother of Divine Providence in 1996, then served as senior priest and in residence at St. Matthias Parish, Bala Cynwyd, before retiring to St. Joseph Villa, Darby. Father Michael Dilorio, who was stationed with Father Gormley and remained a good friend ever after, recalled his wonderful qualities as a priest. There will be a viewing for Father Gormley at Mother of Divine Providence Church on Friday, Feb. 2 beginning at 9 a.m., which will be followed by his 11 a.m. funeral Mass with Bishop Edward M. Deliman as the principal celebrant. Concelebrants will include Msgr. Francis X. Dreger, who was a classmate of Father Gormley at St. Charles Seminary, also Msgrs. Gerard Mesure, Arthur Rodgers and Michael McCulken, and Father Martin Cioppi and Father DiIorio, who will be the homilist. Father Gormley is survived by his brothers, John W. and William J. Gormley, and nieces and nephews. Interment will be at SS. Peter and Paul Cemetery, Springfield. I had the honor of being baptized by fr in Sept of 1955…one of his first!